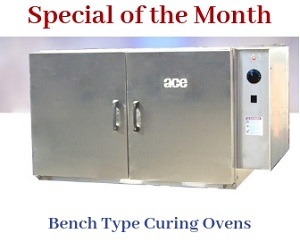 All burn off ovens provided by ACE are fully automatic requiring minimal supervision. This helps in increasing overall efficiency of the system and technicians, resulting in lower labor costs. In the 3299-RT, even heat distribution is achieved by use of a hybrid design. In this design, the radiant heat is circulated evenly throughout the oven ensuring uniform cleaning of the products within the oven. 3. Volume Over Cart 299 CU. FT.
6. Shipping Weight 7,000 Lbs. 1. Cart Rating 8,000 LBS. 11. 2 Top Mounted Pressure Relief Hatch 26.0 SQ. FT.
Hertz 120/1/60 Normal Less Than 3.6 Gal/HR. 5. Natural Gas Inlet Pressure 8″ to 14″ W.C.
6. Propane Inlet Pressure 12″ to 18″ W.C.
Safety is of the utmost importance at ACE. All our products are integrated with safety features that ensure error-free operation. It is also integrated with a One Touch Control (OTC) system allowing for ease of operation. By reducing human intervention, ACE has made these systems extremely safe. With automation, room for human error is also reduced considerably. All of this helps in increasing the efficiency of the system as well as the technician, leading to higher overall output.